RenewYOU Skincare - I really recommend reading this post as RenewYOU Skincare are a skincare brand who have developed products primarily for people who are going through cancer treatment however their products can also be used by people with extremely sensitive skin. Below, you can see all the details about the skincare line and products. RenewYOU Cancertology - a relatively new brand in the UK, launching in May 2018 with their fabulous RenewYOU Skincare range. As I briefly mentioned above, the products have all been specially formulated and developed for patients undergoing cancer treatments or for people who have extreme sensitivities or skin conditions. The brand have also started holding free workshops regularly each month throughout the UK and with this, patients learn about products and ingredients which are good for their skin whilst using RenewYOU in a fun environment. The workshops also provide a selection of free samples for people to take away and try at home too - a nice touch from the brand a great way to get people using the products and seeing what works for them and their skin. So, who's behind the brand? The range has been created by Susan Wolf, LE, COE, LMT. A licensed Aesthetician who trained in Oncology Aesthetics and has spent over seven years working closely with cancer patients and people suffering with sever skin conditions to understand and develop a range of products - skincare and colour cosmetics to suit even the most sensitive of skin. Not only does Susan work on the brand and the products, she also works with the American Cancer Society and the "Look Good Feel Better" program which has allowed her to find her true passion - helping cancer patients and making them feel and look fabulous! RenewYOU were actually really lovely and sent me a few of the products to try - I don't have any skin conditions nor am I going through any treatment but this way, through experience of many years and using different products - I can write about the items in much more detail and hopefully be able to offer advice to people who are looking for products to use. RenewYOU Rest Night Cream - Take a look at the packaging, as you can see, this comes in an airless bottle. This is great to take away with you if you're travelling or undergoing any treatment - have it in your bag and use on the go. The 'rest' night cream has been developed to nourish and hydrate your skin however it doesn't feel heavy on your skin. This is such a lightweight night cream, it melts onto your skin leaving it feeling nourished and extremely hydrated. Even though this is classed as a night cream, I'd say this can be used in the morning too - especially for people who are suffering with dehydrated skin or are more sensitive with the harsh cold weather. Apply this night cream onto your face and neck and let the formulation get to work. How To Use - If you're suffering with very dry or dehydrated skin, apply 4-5 pumps of product into the palm of your hands, 'warm' up the product and massage onto your face and neck area. A serum with a difference! You know how sometimes serums can feel 'tacky' on the skin? Not this - this is totally different and below, you can see all the details. 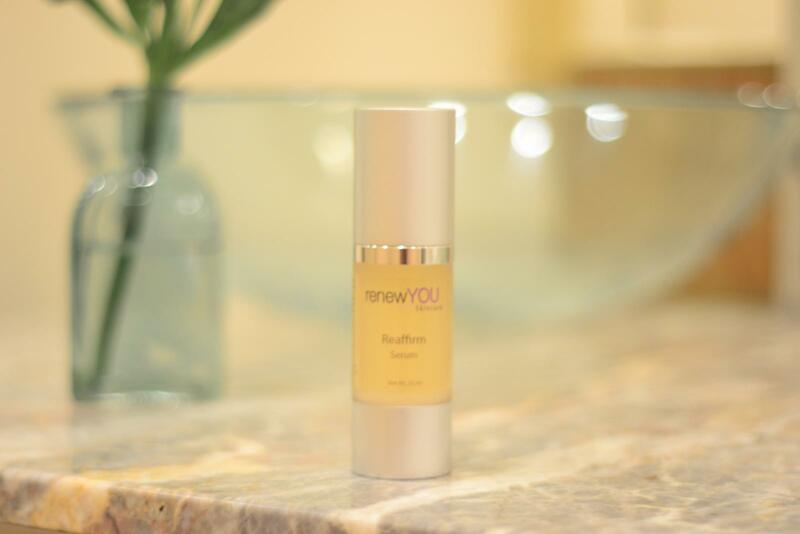 RenewYOU Reaffirm Serum - As with the night cream, this comes in an airless bottle which is great to take away when travelling or great to have in your handbag and a lot more hygienic. I think a lot of brands don't get their serums right - a lot of them on the market feel rather tacky however, RenewYOU have managed to make a serum which not only nourishes and hydrates your skin but leaves it feeling fresh too. If you're suffering your skin at the moment due to the colder weather - pop this in your handbag and apply during the day to give your skin a hydration and freshness boost! This is another really lightweight product and is great to use in the morning and evening - just 'listen' to your skin and use products as and when you feel like your skin needs a boost. How To Use - Keep this in your handbag and apply it during the day to give your skin a hydration boost and to leaving it feeling fresh. The serum can also be used in the evening, before night cream, to 'lock in' all the wonderful ingredients. The products which I've featured above are both lightweight and nourishing however here is where things change. This is a sugar scrub unlike any other that I've tried and this is where RenewYOU Skincare shows you why these products are suitable for even the most sensitive of skins. 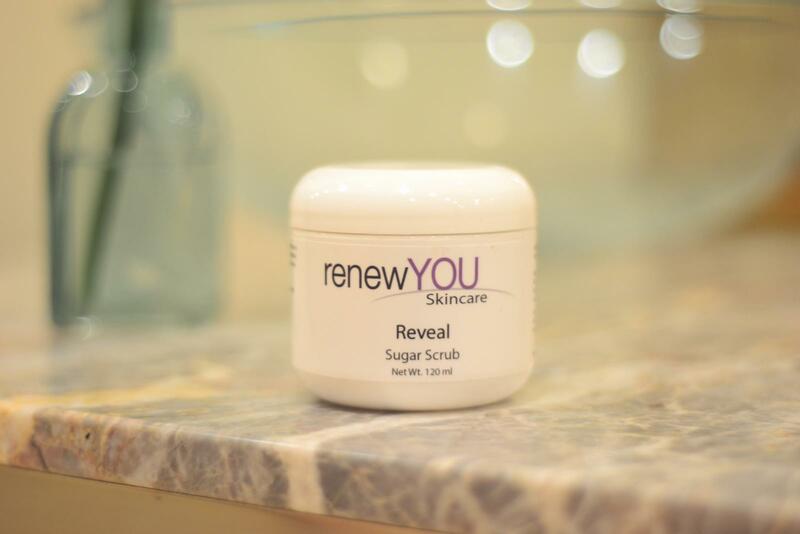 RenewYOU Reveal Sugar Scrub - Sugar scrubs are normally lightweight when applied onto the skin but can also feel slightly harsh - here is where RenewYOU show you why their products are suitable for sensitive skin. The 'Reveal' sugar scrub is unlike anything else - as soon as you apply this onto the skin, the scrub starts to melt onto your skin whilst buffing your skin and has a slightly oily texture. This is due to the wonderful variety of oils such as - Shea Butter, Coconut Oil, Sunflower Oil, Olive Oil and Jojoba Oil which are all ultra-nourishing and hydrating. It's not harsh on your skin and once you use this, you can see why it's suitable for sensitive skin - so everyone can use this to buff and exfoliate skin leaving your body feeling super-soft and nourished. How To Use - Can be used on dry and wet skin. I recommend using this on wet skin and massaging the scrub onto your arms, legs and shoulders - buffing skin and then rinsing and using your body wash of choice. In this video from my vlog a couple of weeks ago, you can actually see how the items arrived - it's all very pretty and pink! 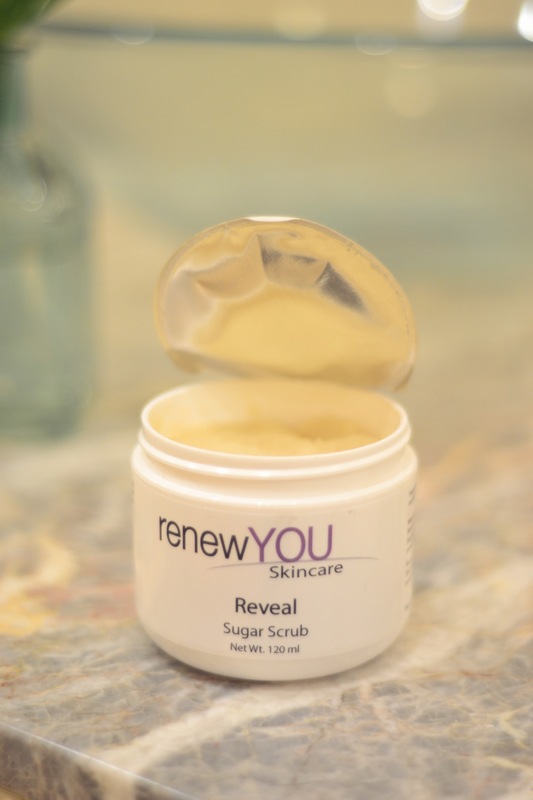 Yep - I featured RenewYOU in a little unboxing video and here, you can check out the video along with a little overview of the products too! I always love reading your comments so I'd love to know what you all think of this range and the items featured in the post. Are there any items which have caught your eye? Do you change-up your skincare routine over the winter months and if so, what are your go-to items? Next Post This iPhone Space Bar Hack Will Change The Way You Message!